Harishayani Ekadashi or Devashayani Ekadashi (हरिशयनी एकादशी / देवशयनी एकादशी) is a special Ekadashi in which Hindu people celebrate by worshiping God Vishnu (also called Hari). 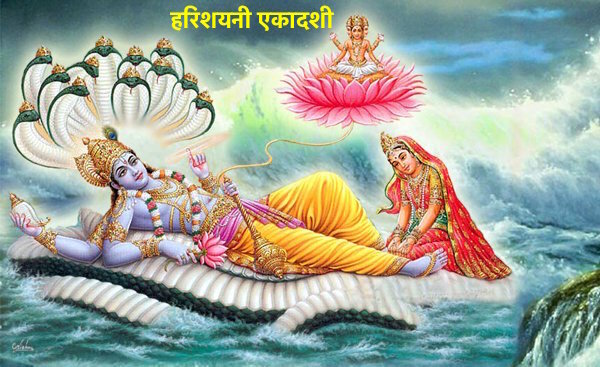 The day, Ekadashi, is a day day that comes every 15 days, and Harishayani Ekadashi is celebrated once every a year. According to legends, lord Vishnu goes the world located underneath the ground (Patal) and lives at the entrance of King Bali of underworld. He returns back above ground after 4 month on the Prabodhini Ekadashi – that falls on Kartik months. In the year 2018, the Harishayani Ekadashi falls on July 23, 2018. On the day, people plant the small Tusli (Holy Basil) plants on the designated planting place in front of most of the houses in Nepal. The plant is believed to absorb carbon-dioxide and give oxygen in the environment. The plant is also popular for its medicinal value in the traditional Ayurveda (the Hindu science of medicine). How do people celebrate Harishayani Ekadashi? On the day, people clean the house and surrounding area, sprinkle holy water ho their home. At the Pooja location in the house they install Sri Hari Vishnu statue made by gold, silver or brass metal. After worshiping the statue, people listen to the Brata Katha. As this is the day the god has gone underground, devotees quit eating some of the foods and quit other habits. For example, the foods to quit include: Jaggery (a sugarcane product) for better voice, Oil – for long life and giving birth to children, Til ko Tel (Oil of sesame seed) to win over enemies. Other things to quit include – telling lies, sleeping on high beds, eating meat or honey. There however is no concrete reason whey these things should be avoided at this time of the year. These restrictions are lifted after four months when lord Vishnu is told to have left his underground residence. During Satya Yuga, there was a king named Mandhata. He was well known for making his people happy and prosperous. As nobody knows what happens in the future, Medhanta was also unaware of the upcoming famine in his country. For three years, there was no rain in his country. That was a very tough time as there was no food to eat and people were restless. The Rishi told him to worship Lord Vishnu on Ashad Shukla Ekadashi. After the king did a huge celebration on the day and fed his people from his godown, there was a huge rain and the country was saved. That is how it is believed to have started the celebration of the festival. Yes, these just stories. Festivals are for fun. Festival are for enjoying them. They give a much-needed-break form a stressful routine. In the olden days, it was the farming routine, these days, it is work routine. Happy Harishayani Ekadashi!